This is a page chosen more or less at random, during the second six month rewrite, after I had signed my deal with Amy. I am hopeless at editing on screen – I need a pen, paper, and lots of time. (And quiet.) And then I do this sort of thing. Whether you call it fine pruning or hacking with a machete is, I suppose, a matter of opinion. One of the reasons I wanted to post this photo is that this kind of close editing is one of the most enjoyable parts of the process for me. The careful chipping away of unnecessary words, the cleaning up of infelicitous syntax, the hunt for clarity – all these things are immensely rewarding. The only downside to it is that it is a never-ending process. I know that if I were to pick up the book today I would still find things I’d like to change. But I cannot. I am learning to ignore those little voices in my head. My work here is done. I’m glad I’m not the only one for whom edits take a lot of time and quiet. Any tips for “learning to love the editing process”? I confess, I am not one of those writers who finds the satisfaction that you do. But I desperately want to! “Infelicitous syntax”. A wonderful phrase. There is far too much of it floating around these days………need more of edited out. Thanks for a great peek at your process. I’ve never used [break], and pen and paper and quiet and time have become, over the years, a part of the process I’ve grown to love. Melissa, the satisfaction is a simple one – just improving the text for the sake of itself. When you do an adverb purge, for example (I need to do lots of these) it’s just good to know that the work is better as a result. Also, for me, sculpting words that are already there is inherently easier than cranking them out in the first place. I slave and sweat over my first draft – although unfortunately this doesn’t translate to less work later on!! As for knowing when that moment arises, I’m not sure I can help you. Only you will know. It’s an inexact science. I think some people actually revise endlessly as a technique to avoid the next step completely; others perhaps submit too soon, when another polish wouldn’t have hurt. I vacillate between wanting the thing off my desk and being reluctant to let it go. But at some point you just need to go: enough. Thanks so much for sharing that, as well as your five-year trek to a finished first draft. 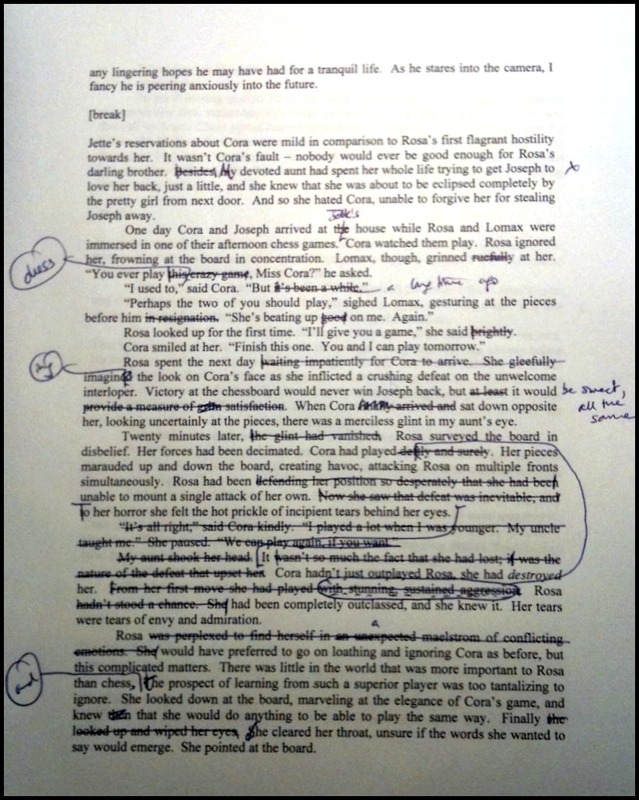 That edited page is a horror… and a challenge! I’d have to queue up the Rocky Theme, get out my red pen, and clear the screen. And please keep the coffee a’comin. I really look forward to reading The Good American! !